Tinted Day Cream richly moisturizes the skin and gives it a subtle, natural glow. Tinted Day Cream balances the skin’s oil and moisture levels while supporting its natural moisturizing functions. Harmoniously blends with your natural skin tone for an even complexion, as its light floral scent soothes the senses. Formulation: Nourishing avocado and almond oils with protective rose wax, beeswax and quince seeds balance skin and help prevent dryness. Rose, quince and St. John’s wort extracts tone and support elasticity. Nourishing rose water and anthyllis extract have a balancing, harmonizing effect. Skin Condition: For normal, dry, sensitive, reddened and mature skin. Love this product. It is very moisturizing and does not cause caking or drying to my skin throughout the day. 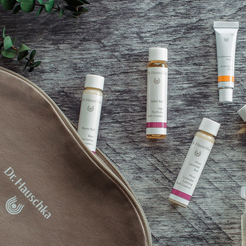 I will surely be recommending Dr. Hauschka products to all my friends. I have been using this product for two years now and I love the fact that it makes my skin Dewey and Glowy while at the same time providing coverage without looking heavy. A little goes a long way but this day cream works great when mixed with Rose Day Cream. It gives you just a hint of healthy color. Love! It's ok. I thought it was too greasy. The tinted day cream is wonderful for first thing in the morning application if you have a busy morning routine. It provides just the hint of color needed and the moisture rich touch to get the day started fast. Also, wonderful for anytime you need a hint of color fast. Great product! Went on smoothly and gave me a subtle hint of a tan. Would recommend. I enjoy many Dr. Hauschka products and this tinted day cream is one of my favorites! I have dehydrated skin and this moisturizer really hydrates and imparts a nice glow. Somehow this came out more greasy than I expected, and the color was darker than my skin. I only got a small size, so not much was wasted. Might work well for other skin types but I do recommend getting the travel size first to make sure. Foundation is my least favorite makeup product even though I realize my face looks better with some sort of coverage. I used the Dr. Haushka foundation and I thought it was my favorite until I got a sample of the tinted day cream. I love the tinted day cream. It is so luscious, makes my face look dewy, and the tint is almost imperceptible. I like the Tinted Day Cream because it's a balance of two functions in one product. It gives my face skin the protection needed along with a natural tint to help not look like a ghost in this wet on/off rainy soggy damp off/on foggy weather we keep experiencing in the State of Southern Vermont. Contrary to what everyone believes all this wet weather doesn't help keep my face skin moisturized. I actually use it to protect my face skin against all MOLD forming and becoming more of a burden that is being caused by all this rain and wet weather we keep getting pounded with. I was not sure what to expect. I am not sure if it is suppose to mix face cream and foundation together. It seems to work. The title of this cream sounds awesome, but it is very greasy and it stays on top of the skin- practically it didn’t get absorbed throughout the whole day and with my dry skin type that was surprising. I also have a sensitive skin and it didn’t give me any irritation so that was good but in terms of tint it doesn’t do much either. Also I couldn’t select a different shade while shopping and that makes options limited. The cream is a bit heavy for me so i avoid using it on hot days. Other than that it gives my skin a lovely color and it feels good especially in colder months! I gave this product one star because of the nice shade of tint but I wouldn't use this product again. It was extremely oily and heavy on my face, almost to the point of waxiness. I even tried blotting it and applied a mineral powder foundation but my brush dragged on my face. I cannot recommend this product. Tried the Tinted Day Cream and absolutely loved it. It has just the right amount of color and feels so light on my skin. I don't like to wear foundation so this works perfect for me. Too oily and heavy for me. I found the tinted day cream too oily and heavy for my skin. I love this cream and am ordering my 3rd tube. I have fair, dry skin and most foundations are either too light, or too dark for me and they always make my skin look more dry. I have very fair, sensitive skin so this cream is too heavy and extremely dark colored. My favorite moisturizer got an upgrade! So much easier to apply - provides great moisture and a healthy glow! I have dry sensitive skin and can't use most products because they irritate my skin, this one worked very well without any bad side effects. Light enough for use in the winter, when my skin is on the paler side. Yet, also gives me a great glow in the summer as well. Wonderfully hydrating. I find this works better than a foundation because it doesn't settle in fine lines and make them more visible like a foundation does. Smells fab! I highly recommend the Tinted day cream! It’s just the right amount of light coverage, you can’t tell I’m wearing make up but smoothes out blemishes and coloring and gives me just a tad sun kissed glow to this Scandinavian complexion. I also love that it’s hydrating all day but never greasy. This is my favorite face product that I have ever tried and it’s the reason I’m now slowly converting over to Dr. Hauschka products for all my skin products. This day cream is the best! Adds a little color and helps my skin tone look even without any makeup! I bought this under the impression it would be good for normal-dry skin. It is very heavy/greasy and sits on the top of my skin. I was very disappointed with this purchase. I like the feel of this cream, but I am fair skin and it looks pretty dark on me so I only really use it when I have or want to look like I have a tan. I wish it covered a little more as well. Really disappointing. Never soaks in, ruins your powder brushes; unbelievable frustrating process with skin care. I want to return it for a full refund. I wanted to try this because I don’t wear much makeup, but want my skin to look natural, even, polished, and healthy. After I use Dr. Hauschka cleansing milk, toner, and rose day cream, I apply this. It’s does just what I want, and it’s not heavy or cakey. It’s like I’m wearing nothing and I like it’s easy to apply and takes 30seconds, literally just like putting on a moisturizer. Also like that you can try a sample size before you buy. This is very rich and greasy, which will eventually dry out. I like the slight color. Love the way my skin looks and feels with this tinted day cream! i’ve tried a few tinted moisturizers and this one is by far the best. it has a great sun kissed color. my skin is not too fair so it might be a little too dark for a fair complexion. give it time to dry before applying the rest of makeup. I was nervous that the Tinted Day Cream had been changed however the update is great! It’s as thick and creamy as always with a touch lighter shade so I am even able to use it in the winter and don’t feel like I put on too much color. It keeps my skin really moisturized in the winter months as well. I have oily skin in the Spring Summer and Fall and use the Day Oil, but in the winter months my cheeks get dry. A Dr. Hauschka representative suggested applying this just to my cheeks and it has been lovely. My cheeks are moisturized and they have a glow now too! This tinted cream is perfect! Just a small pea-sized amount is all I need to even my complexion and get a lovely glow. My skin looks young and fresh. This cream is part of my morning routine no matter what the day brings. It is particularly helpful before early morning dog walks in a variety of temperatures and conditions. It seems to provide a nice barrier to the elements. This is the most wonderful, ingenious facial moisturizer ever! I have been using it for over 20 years, and it is every bit as effective now as it was when I was 20 years younger! Glides on effortlessly and adds a beautiful, glowing tan to my face. Use alone or for added coverage, I use it either before or after applying Hauscha foundation. Blends effortlessly either way. I will never be without this product! Lightly scented for my ultra sensitive olfactory! From the first time I tried this product I was stunned how it melted into my skin like a butter. This was before all the tinted creams came into fashion and it was and is still now my favorite cream. It is especially great for winter when I get pale and need some richer protection against the cold. It's wonderful under makeup also. I love the overall creamy look that this tinted moisturizer gives me. It's a good tinted cream overall, I love the smell, but the coverage is very light considering how thick the cream is. Overall, not bad. Unfortunately it is too dark in color for me. I hopef that it would be lighter/more neutral. The tint is too dark for me that i will not continue using it especially not in the winter after my slight tan is gone. I am a nordic type. Blonde blue eyes fair. It's a relief to actually know what I am putting on my skin. As important, I think, as what one puts in their body. I use with the Translucent Bronzing Tint. I like tinted day cream because it combines a blush wirh moisture. I really like this tinted day cream, summers in Ohio are pretty humid and so I tend to not bother wearing makeup as it soon melts away. The tinted day cream is perfect as it adds a just a hint of color and a perfect glow without feeling heavy. I'm not sure I will ever bother to go back to using my foundation, even in the winter as this works so well. Each morning after cleansing and toning, apply evenly to the face and neck. In the evening, we recommend using a revitalizing Dr. Hauschka serum as a basic, oil-free night care product after cleansing and toning. For a dry skin condition apply Tinted Day Cream over Revitalizing Day Cream. To add a customized tint to any Dr. Hauschka moisturizer, Translucent Bronzing Tint is available. For added coverage, see our range of Decorative Cosmetics for the face.